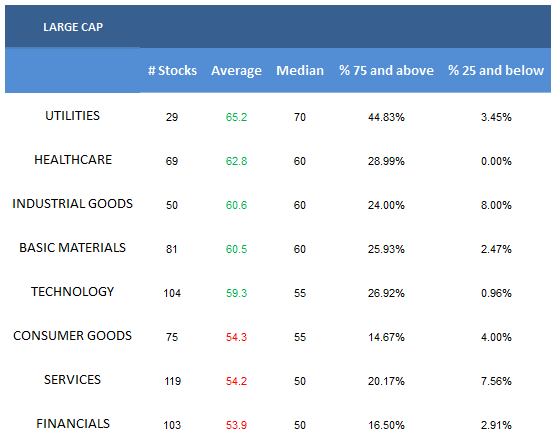 The best large cap sectors are utilities and healthcare. The highest scoring large cap industry is insurance brokers. The average large cap score is 57.77. 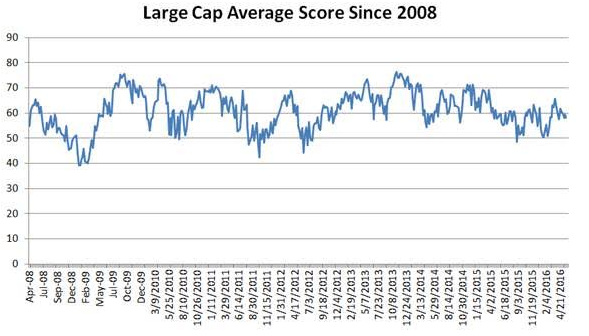 For comparison, the rolling four week average score across large cap is 58.77. The average large cap stock in our universe is trading -18.66% below its 52 week high, 2.09% above its 200 dma, has 4.43 days to cover short, and is expected to grow EPS by 13.9% in the next year. Utilities and healthcare score best (healthcare continues to recover ground since popping back above average on May 10). Industrial goods, basics, and technology also score above average. Consumer goods, services, and financials score below average. Note: there has been marked improvement in individual bank stock scores since odds increased for a June rate increase. The following chart shows historical scores over time. The best large cap industry is insurance brokers (MMC, AJG). 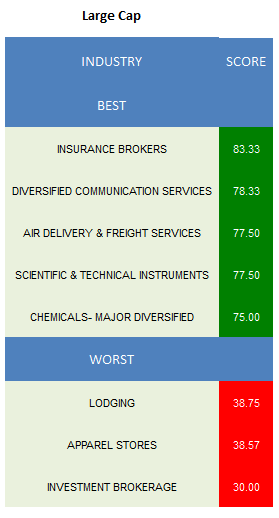 Diversified communication (AMT, CCI), air delivery & freight (CHRW, FDX), scientific & technical instruments (MTD, A, GRMN), and major chemicals (FMC, EMN, SHW, ASH) also score highly. In basics, focus on major chemicals, independent oil and gas (PXD, OXY, EOG, COG), and steel and iron (TX, SID, PKX). Cigarettes (PM) and processed and packaged foods (MKC, PEP, CPB) are top scoring in consumer goods. The best financials industries are insurance brokers, money center banks (STI, BK, BNS), and credit services (DFS, SLM, EFX). Medical instruments (BCR, COO, BSX), medical appliances (EW, MDT, ISRG), and drugmakers (JNJ, PFE, BMY, ABBV) can be bought in healthcare. Diversified machinery (IR, ITW), industrial equipment (PNR, PH​), and aerospace/defense (TDG, BA, NOC, HON) are top scoring in industrials. Aerospace tends to perform nicely through air show order season. Air delivery/freight, restaurants (YUM, DRI, QSR), and discount stores (DG, WMT) are best in services. 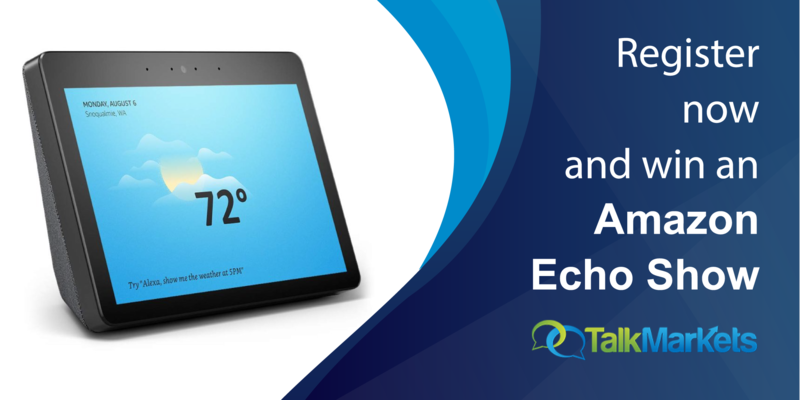 The top technology groups are diversified communication systems, scientific instruments, and Internet software (EQIX, CTXS, CRM, FFIV, AMZN). Diversified utilities (NI, SCG, PEG, EXC) and electric utilities (NEE, NRG, EIX, AES) can also be owned.